Memorial Day weekend is over. I actually didn’t realize I had Memorial Day off until the Monday before it happened; it was on the holiday schedule but somehow I had managed to overlook it. It was a really great surprise to have a three-day weekend show up unexpectedly in my calendar; I think I really needed it. Our next holiday is July 4th, which is on Friday this year, making it another long weekend. I’m already looking forward to it. We had a pretty low-key holiday; had I known I had the day off in advance, we might have planned more stuff, but maybe not, since we needed to stick around town and hang out with Haylee, who’s still not 100 percent. 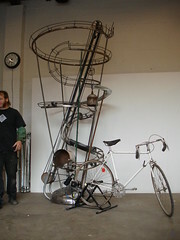 Paul does a lot of art and rides that you interact with via bicycles. The exhibit area was full of kids, and there was dancing and face-painting and popcorn, and I even had a V8. There’s a bit more about this event here. I also learned the dump is easily accessed by public transportation, although we hitched a ride in a private car. Afterwards, we headed to Glen Park and ate pizza at Gialina. We tried the huge and delightful antipasto plate, and the pesto and puttanesca pies, which were both delish. I also really enjoyed the kid’s pizza we ordered for O, which was cheap and kind of huge. I wonder if you’ve actually got to show up with a kid to get one? I really liked this place; I think it gives both Pizza Delfina and Pizzeta 211 a run for their money, and you can actually get in, which is a plus. 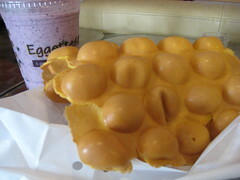 For dessert, we went next door and ate some Eggetts. They’re very big in Hong Kong, I hear. If you try them, go with coconut. And I thought the caramel dipping sauce was the best. On Sunday, we decided to have a relaxing afternoon in Golden Gate Park, just laying around. K. brought books and magazines, and I brought my ukulele, thinking I could practice a little, quietly, unobtrusively, as long as we were nowhere near a drum circle. We parked at Page and Ashbury and walked down to Haight for lunch before we went to the park, and I really felt like I fit right in with my uke case sticking out of my backpack. An musical-looking person carrying a guitar even stopped me and chatted me up. After lunch we plopped ourselves down on the lawn of the Conservatory of Flowers. It’s such a great building; I found this postcard online. I’m actually not very good and just sitting on a blanket and chilling out in a park, which is the reason I brought along the uke. I tend to get a little anxious, like maybe I should be doing something besides just sitting there. With my uke handy, I could practice, which kept me from getting fidgety. I played for a while, but quietly, since I was a bit concerned that I was bothering people. I mean, do you really come to hang out in a park and expect to hear an amateur ukulele player strumming chords? Then after a while, things cleared out around us and I was feeling a bit more comfortable with my public strumming. After a little while, though, a group of women came over and sat down close, and one of them came over to see what I was playing. She had a baritone uke at home that had been her husband’s, but she said she hadn’t played it for years. She told me they planned to sit and listen to me play, but “no pressure.” It was some pressure, of course, but they complemented me between every song, so it was sort of sweet. I played and we hung out until the fog rolled in over us and it too cold to stay any more. Monday, the last day of the weekend, was good as well. In the spirit of the holiday, we grilled chicken and ate chips and dip. We took Tex on a walk with C. and I took a nap in the middle of the afternoon. I’m now well rested and in good spirits. And it’s time to go back to work. So, last Thursday it got up to 97 in the city of San Francisco, and we walked around at night in light jackets and were comfortable. Today we’ll be lucky hit 65. Last night I had to put on a wool hat when I took Tex out for his evening walk. I’m still learning about the weather here, but the differentiating factor seems to be the fog. 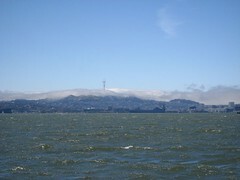 On Sunday, the day the warmth really ended, we took a catamaran trip around the Bay, and I shot the picture above, where you can see the fog blanketing the city. The radio tower you see there sticking up above the fog is the one we can usually see from our back windows, but today I can’t see the tower, or Mount Sutro, where it lives, at all. For those looking for an update, Haylee is still mostly sleeping off her surgery, not so interested in kibble, but quite motivated to eat cold cuts. 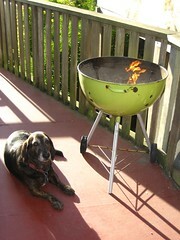 Free range organic turkey or 99 cent bologna, she doesn’t seem to care. Just as long as it’s not her regular food. It’s been pretty busy since we got back from Hawaii. For example, J&C got married in New York the first weekend in May, so we went to City Island for the big event. On the weekends we haven’t been traveling, we’ve been making it a point to explore the city like tourists. We utilized our San Francisco “stairway walk” guidebook and had an exhausting climb through Eureka Valley the last weekend in April, and last Saturday we walked along the edge of the bay from Chrissy Field down to Fort Point, which is directly underneath the Golden Gate Bridge. On Sunday, we decided on the spur of the moment to head to the Napa Valley and do a little wine tasting. Sometime in the middle of all that Haylee unravelled a piece of carpet and swallowed a bunch of yarn. The result was a big fat scary expensive mess. Long story short, Haylee spent a couple of nights in an animal hospital having surgery and spending my 401K contribution. Tex got the run of the house for a while, as you can see from the picture above. Haylee is back at home today, although not tremendously perky. Keep your fingers crossed. On another note, today is Matthew Wood’s birthday, so I’ve been thinking about him a lot. I wish, for example, that I could tell him we finally bought some good knives, and that he was right, they really do make a huge difference.